The AKC Canine Health Foundation (CHF) funds research for the benefit of canine health. They also support canine health through educational grants. Carla Barstow, DVM, MS, DACT is one example of a success story from these grants. She was born into the dog world as the daughter of a Samoyed breeder. Growing up, she competed in Junior Showmanship and helped her mother breed, raise, and show their Samoyeds. She remembers the long commute to access the veterinary specialty care needed for their breeding program and knew she wanted to support the dog world as a veterinarian specializing in reproductive medicine. 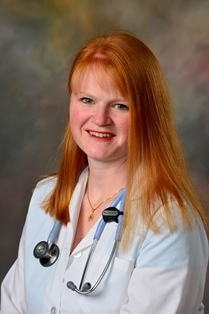 Dr. Barstow has always worked in a clinical setting, starting as a veterinary technician during her undergraduate studies, continuing as a certified veterinary technician, and then as a clinician after graduating from the University of Minnesota College of Veterinary Medicine. It was at the University of Minnesota that Dr. Barstow met her mentor, Dr. Peggy Root-Kustritz, who introduced Dr. Barstow to the Society for Theriogenology and helped plan her veterinary school path, setting her up for a successful career in canine reproductive medicine. Dr. Barstow participated in CHF’s Veterinary Student Program and received financial support from the Orthopedic Foundation for Animals to attend CHF’s National Parent Club Canine Health Conference in 2011. There she was introduced to leaders in veterinary reproductive medicine and research, as well as the breeders and owners whose dogs benefit from their work. Theriogenology is the branch of veterinary medicine concerned with reproduction, including the physiology and pathology of the male and female reproductive systems, and the clinical practice of veterinary obstetrics, gynecology, and andrology. Dr. Barstow planned to earn her theriogenology credentials through clinical practice, but when an American Kennel Club/AKC Canine Health Foundation/Theriogenology Foundation Theriogenology Residency became available at Auburn University, it was an opportunity she could not pass up. The Theriogenology Residency Program is a collaboration between these organizations to increase the number of trained practitioners in companion animal theriogenology and clinical genetics. The two-to-three-year residency program provides specialty training in all aspects of companion animal reproductive medicine and surgery, clinical genetics, as well as clinical practice related to male and female reproduction, obstetrics and neonatology. During her residency, Dr. Barstow saw patients through the Theriogenology Service at the Auburn University Veterinary Teaching Hospital while instructing veterinary students in the hospital and in the classroom, and participated in breeder educational seminars and outreach to the community. As part of her residency, Dr. Barstow conducted research on the effects of fatty acid supplementation on sperm quality in dogs. A manuscript describing her results is in preparation for publication. Additional publications on breeding soundness examination and management of high-risk pregnancies further reinforce her contributions to veterinary reproductive medicine. Dr. Barstow completed her residency in July of 2018 and became board-certified by the American College of Theriogenologists in August. She is now building the canine reproductive service at a small animal primary care practice in her hometown of Tampa, FL. Dr. Barstow notes that the most challenging part of clinical reproductive medicine is also one of the most exciting – keeping up with advancements in genetic testing for dogs and how to use these tools to breed better and healthier dogs. Dr. Barstow is grateful for the opportunities and exposure afforded through her involvement with the AKC Canine Health Foundation. She has had the opportunity to educate veterinary students, general practitioners, breeders, and dog enthusiasts at the local and national level, and to interact with top researchers in the field. Her passion for working with dog breeders to improve the health and well-being of current and future generations of dogs resonates with anyone fortunate enough to share their life with a dog. The AKC Canine Health Foundation is committed to ensuring a healthy future for all dogs. Through educational grants, they encourage the next generation of veterinarians and canine health researchers, ensuring advances in veterinary medicine and educating additional veterinarians to care for the health and reproductive needs of all dogs for years to come. Please learn more about the AKC/AKC CHF/TF Theriogenology Residency Program at akcchf.org/therio and support CHF’s educational grant programs to ensure a healthier future for all dogs.